3 performers. 20+ pieces. 60 minutes. Working at break-neck speed, the multi-talented performers of the The Fourth Wall combine music, theatre, and dance in this sprint-triathlon variety show. The audience chooses the show order by picking cards from a deck and even determine parameters for some pieces created on the spot. Every performance is unique! As the onstage timer ticks down, The Fourth Wall will blow your mind with tricks, bust your gut with laughter, and maybe even bring a tear to your eye with beautiful music. Time flies like an arrow... Fruit Flies Like a Banana!! Founded in 2010, the Fourth Wall has been inspiring and delighting audiences all over the country with their hybrid arts performances. As winners of the 2014 Savvy Musician in Action chamber music competition, The Fourth Wall was featured as performers and workshop leaders for the innovative music entrepreneurship retreat. In 2013, they traveled to Alaska to be ensemble in residence for the University of Alaska, Fairbanks New Music Festival. 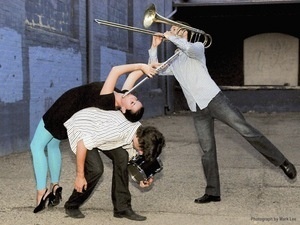 The trio has been featured on the National Flute Association's annual conventions in 2010, 2012, 2013, and 2014 with gala performances, recitals, and their audience interactive project, "Mixer." Outside the realm of classical music venues, The Fourth Wall as been spreading contemporary chamber music to new audiences at Fringe Theatre Festivals in Indianapolis, Rochester, and Houston. Collaborating with conductor Victoria Gau, The Fourth Wall created an orchestral hybrid arts performance, soloing with the Capital City Symphony in 2013. In the spirit of collaboration and to promote new music, the Fourth Wall performed the inaugural concert of the Boston Composers' Coalition—a collaborative organization dedicated to the creation, performance, education, and dissemination of new American music. Each of the six composers in the core group plus a student composer wrote a new piece especially for the Fourth Wall, which was then performed at several venues in the Boston area and was broadcast on a live feed on the internet. As strong advocates of education, the Fourth Wall also offers workshops that teach students how to incorporate interdisciplinary performance techniques into their performances. Members have shared their work with students of the Boston University Academy, Houston Youth Symphony, Texas State University – San Marcos, University of Houston, University of Alaska – Fairbanks, Indiana University, New York University, the Eastman School of Music, Rice University's Shepherd School of Music, the Manhattan School of Music, the Flute Society of Kentucky, and the New York and Indiana Percussive Arts Societies. The Fourth Wall is ensemble-in-residence for the International Flute Symposium and are teaching artists for Indiana’s Arts for Learning program. Members of the Fourth Wall have attended the Eastman School of Music, Oberlin Conservatory of Music, the Peabody Institute of Johns Hopkins University, Ohio University, and Rice University's Shepherd School of Music.